Trollbeads Sterling Silver Bangle Bracelet. 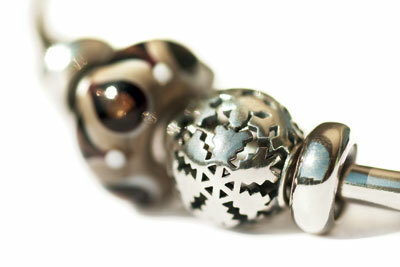 This is a very exciting addition to the Trollbeads bracelet line! The Bangle bracelet design has been created with a thick rounded cuff of silver that slips over the side of your wrist. This chic and stylish bangle is available in 4 sizes. You will need 2 Stoppers to use on either side to keep the beads on your Bangle. Click on this link to purchaseStoppers! Look how great the beads sit on the Bangle below! Just got my Bangle, and I absolutely love it, I got the black faceted bead and it looks lovely, What I most love is how the bead stays in place, so i see it all the time...... ;) Im already thinking about getting another one!!! Click the button below to add the Silver Bangle Bracelet to your wish list.